The skulls of certain juvenile sauropods underwent radical alterations in their progression towards adulthood, reveals a study published in the latest issue of the Journal of Vertebrate Paleontology. The theory comes after the rediscovery of a fossil head of a juvenile Diplodocus from the collections of the Carnegie Museum of Natural History, in Pittsburgh. 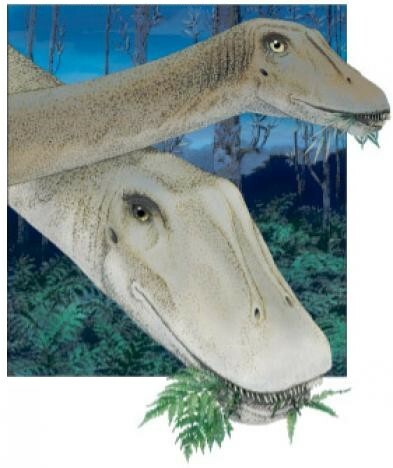 A Diplodocus carnegii adult and juvenile feeding. Image credit - Mark A Klingler/Carnegie Museum of Natural History. “Although this skull is plainly that of a juvenile Diplodocus, in many ways it is quite different from those of the adults,” said John Whitlock, palaeontologist from the University of Michigan. The find provides the rare opportunity to study the early development of Diplodocus carnegii, a creature which lived 150 million years ago – especially since most of our understanding of sauropod skulls has been derived as of now from adult specimens. It is thought that the changes in skull shape might e due to a change in diet – with the narrow snouted juveniles eating a different selection of food to limit competition with the adults of their species. Another possibility is that the juveniles were more picky diners, only choosing to eat the higher quality parts of plants. The juvenile skull, which has had such a newfound significance, was first collected in 1921 – highlighting the importance of preserving and reanalysing museum specimens. It is now on display in the “Dinosaurs in Their Time” exhibition at the Carnegie Museum of Natural History.